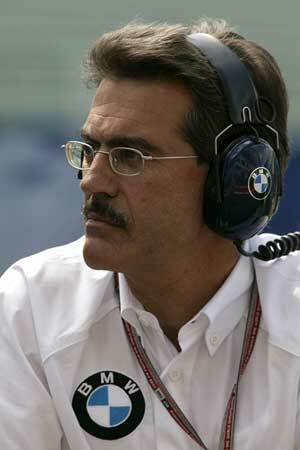 Mario Theissen is the boss of BMW Motorsport - and the newest Formula 1 team principal. The German car manufacturer has announced its purchase of Sauber and the aim is to create a new manufacturer team in the sport. To take BMW to the World Championship. Theissen is a man with ambition but the one thing that is never lacking in the sport is ambition. The hard thing is to do the job and win. Buying Sauber makes a lot of sense to BMW but not to many others in F1 circles. The team is isolated, based in the middle of Switzerland, a long way from the Formula 1 cluster that exists in England and a long way from Ferrari in Italy and Toyota in Cologne. It is even a long way from BMW headquarters in Munich. Up to now Theissen has avoided talking about his plans for the team but now he admits that it is not going to be easy. "We have only just started to integrate the two so far independent operations in Hinwil and Munich," Theissen says. "We have a very clear approach of how we are going to do this. We will not just start talking to people. The first thing is to streamline the processes. Together with the Swiss guys we are thinking about how the integrated team will operate. That is the first step and that may take us a month or two. The processes must come first and when that is done we will develop the organisational structure we need to run the whole thing according to the plan and after that we will define the individual tasks and only then will we look for people to handle them." All of which means that the 2006 season is not really going to be about a BMW but really a halfway house between Sauber and BMW? "It will be an interim year," admits Theissen. "I am very confident that we will complete the process of reorganisation before the end of this year and we will have the set-up in place before the season. We know already that we have to ramp up the operation in Switzerland but in Munich we will not change very much. The power train - and it will be more than just the engine - will come from Munich and we are well staffed and well-equipped to do that. We will do the car in Switzerland as we do today. We found that there is a superb wind tunnel there that does not need any changes. The only thing we have to do is to increase the staff because at the moment they are not able to run this superb tunnel in three shifts. The rest of the facilities are good but need some expansion as well. Basically we will extend the facility, we will increase the staff and we will increase the annual budget. I do not think it is more difficult to operate out of Switzerland than out of Germany. The marketing of the BMW brand will be done out of Munich. The race team will be in Switzerland. "All the ramping up in Switzerland will take more than six months. If we put up new buildings, hire new people or develop new people inside the team it may take 18 months or something like that, so for that reason next year will be a learning year. A start-up year." However BMW is already working closely with Sauber on the new car which will feature the new BMW V8 engine. "We are not talking about engine-car integration for next year.," Theissen says. "So we have started to design next year's car and the engine has been on the track already and designers and engineers are talking about how to integrate everything to get the optimum package for next year." Theissen says that the team has yet to develop its brand identity and will soon decide about whether to keep the blue and white theme that is used by Williams. "It is something which will be developed in the course of the next month," Mario admits. "We have quite a lot of issues on the table and we are tackling them step by step. This one will be dealt with in the autumn there is no clear decision as to how we do it but I know that we will be able to present the entire operation early in the next year - including drivers and even team principal." What Theissen will say is that there will be sponsors on the car but Theissen says that at the moment none of the Williams sponsors are switching camps. "We are certainly not chasing them," he says. Theissen says that BMW does not want to pick the drivers for any reason other than performance. "We will select drivers on the basis of performance: not nationality, nor religion nor based on whether or not they smoke. You can only market success and the driver is a very important part of the performance of the overall package. That is what you have to look for. We are quite busy putting corner stones in place to improve the facilities but we will talk about drivers soon - maybe at the end of August. There are a lot of issues to deal with you because you want to develop young drivers to be really linked to the team but on the other hand you want experienced guys, particularly when you get to testing. You can go either way. It will take some thought and will include all the specific names available and we will see what could fit and what could work. I don't have a clear view right now but certainly some people are knocking at the door. We will be in a position to get the drivers we need for next year. It is absolutely clear that we will not challenge for the championship next year." Money is not everything and Theissen says that BMW will try to avoid the mistakes made by others. "We have learned from experience, having been in F1 for six years," he says. "It is not just on the engine side but also in terms of cooperation with the team. Certainly we have seen examples of things that went wrong and we have learned from that. We will see whether or not we have learned enough." There is an argument that trying to build up an F1 team outside the British F1 cluster is a bad idea. Does that worry Theissen. "I am worried day and night about various things about not being competitive," he admits. Certainly there are two aspects to this: one is that there is a source of experienced people over there in England and so if you are in a situation to ramp up something quickly it would be good to be in that environment in order to attract those guys on a short term basis. However in the long term I think it is a disadvantage to be there because not only would those guys be attracted by other teams. I think if you look at Ferrari, Sauber and Toyota they have developed outside the cluster and I think that gives you very loyal people. These people do not think about changing to another team because it would be a major change in their lives. In England you do not even have to move house when you change teams and to me it is very important to have people who identify themselves not just with F1 but also with our team. In the long-term I think it is beneficial to be outside Britain. It is probably the hard way to build up a team but in the long term I do not see a disadvantage. It certainly takes more than a year to become a competitive team. We know this. We know that we are at the beginning of a learning curve and we have to be patient and persistent. We will be." This seems to suggest that the new team is going to be doing a lot of local recruiting from the Swiss and German universities. "The universities are there to be drained," Theissen says with a smile. "Basically there are three sources for new people: one is young guys from university. The second is people from inside BMW. And the third is that you can take on people from the other teams. Certainly there will be people coming from other teams, but that is not our strategy to grow the team like this. Our strategy is to groom people within the team to create organic growth. It is important that people fit into the system and I am really concerned about getting people who understand the way we want to work. If you get people like that that we can make this work!" As Theissen says it is a risk but it's a challenge that BMW wants in F1.